Today the inmates and I processed the rest of the bacon. It was another 47 pounds bringing us to the 110 pound total. We used a mix that Brian came up with which was 2.4 ounces of pink salt, 3 pounds of kosher salt, and 1.1 pounds of white sugar for our salt rub. 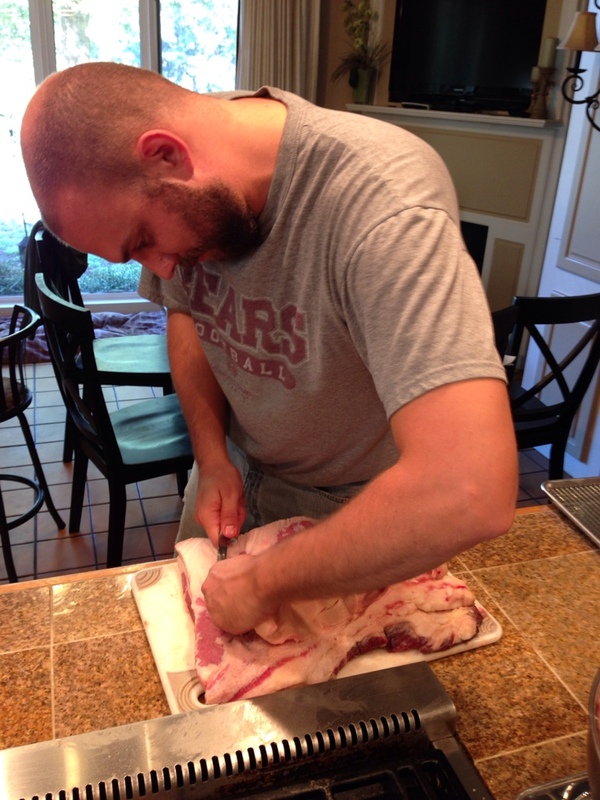 We skinned the pork bellies, then rubbed the mix all over including the sides and any crevices. We then put the pork on racks in sheet pans and covered them with Saran Wrap. 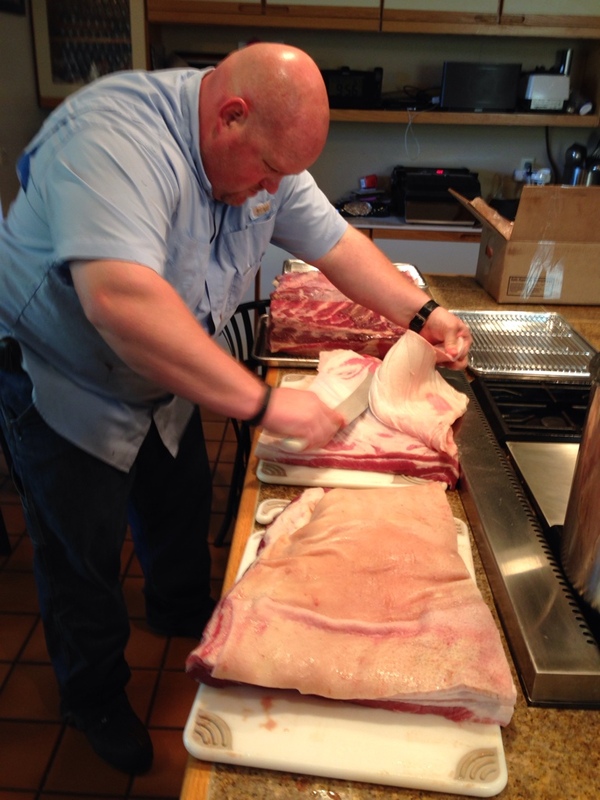 Here is John trimming out a pork belly. Everybody got their hands dirty today. 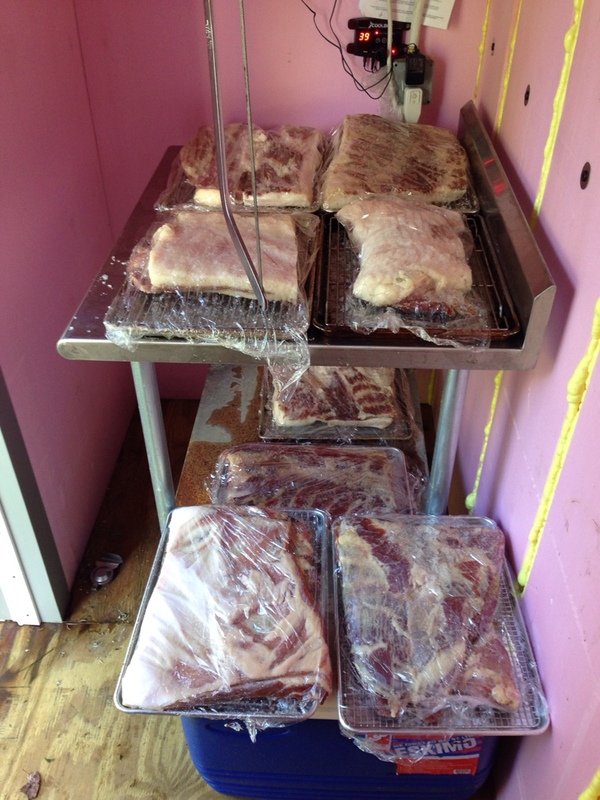 Here are most of the pork bellies prepped and ready in the walk in. 7-10 days and we will pull them and smoke them for a few hours. Then we will pull the bacon, put it in the freezer and get it sorta hard. Then it will be a field trip to Angie’s restaurant where she is kind enough to let me borrow her meat slicer. Once sliced, we will bring the whole lot back to the house and sort it out into 1 pound packages and vacuum seal them, label them, then freeze them. It sounds like a lot of work, and it is, but this should be totally worth it. Plus this will be our first product from the new smoke house. Mmm, smoked bacon.